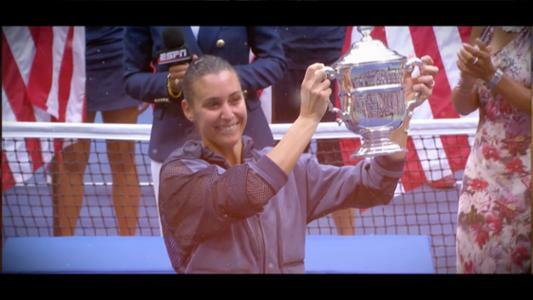 While the flag at the USTA Billie Jean King National Tennis Center waved red, white and blue, the two finalists in the 2015 women’s singles final painted the court red, white and green, as Flavia Pennetta and Roberta Vinci vied for the title in the first all-Italian women’s final in Grand Slam history. World No. 1 Serena Williams had won the first three major titles already that year, capturing the Australian Open, French Open and Wimbledon crowns. She was a huge favorite to also win in New York and by all odds was expected to be the first player to capture the calendar-year Grand Slam since Steffi Graf won all four majors in a single year in 1988. People were so convinced that the tennis superstar would secure a spot in the title match that the women’s final sold out prior to the men’s for the first time in the history of the tournament. But it was not to be. In one of the biggest upsets in tennis history, world No. 43 and doubles specialist Vinci shocked the American No. 1, 2-6, 6-4, 6-4, to reach the final and dash Serena’s dreams of winning the Grand Slam. On the other side of the draw, another Italian, Pennetta, who at the time was ranked No. 26 in the world, had quietly navigated the draw, knocking out 2011 champion Samantha Stosur in the fourth round, No. 5 seed Petra Kvitova in the quarterfinals and No. 2 Simona Halep in the semifinals. The world was stunned. Italy rejoiced, and Italian Prime Minister Matteo Renzi made the trip to Flushing Meadows to watch his countrywomen battle for the title. Pennetta and Vinci had known each other since the age of nine. The longtime friends, both of Puglia, Italy, grew up together on the junior circuit, were roommates while training in Rome and even teamed together to take the 1999 French Open girls’ doubles title. In the first US Open final to feature two players ranked outside the Top 20, Pennetta’s baseline game and penetrating backhand overpowered Vinci. She triumphed in the 93-minute match, defeating Vinci in straight sets, 7-6, 6-2, to become just the second Italian woman in history to capture a Grand Slam singles title, following Francesca Schiavone, who won the French Open in 2010. Pennetta’s win was magical, but it was what she said at the trophy ceremony that made the moment most memorable. After raising her trophy, hugging Vinci and waving to the fans in Arthur Ashe Stadium, she announced to the crowd that she was retiring at the end of the year. And with that, the Italian had reached the pinnacle of her career and said goodbye at the same time. What better way to leave than at the top. 50 Fact: At age 33 years and 6 months, Pennetta became the oldest first-time Grand Slam champion in the Open era when she won the 2015 women’s title. At 66 years and 19 days, she and Vinci played in the oldest combined-age Grand Slam women’s final in the Open Era. The previous oldest was contested at 1977 Wimbledon between Virginia Wade and Betty Stove, whose combined age was 63 years and 11 months.